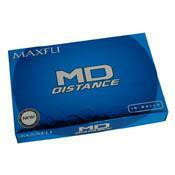 The new MD Distance is the longest, straightest Maxfli ball ever made. MD Distance offers low-spinning distance technology for extreme long drives and poinpoint accurate irons. Its dimple pattern provides a high launch ball flight for wind-resistant stability and maximum control. The high-energy core is titanium-enhanced to ensure low spin, maximum initial velocity and long, accurate distance.